SEATTLE -- Another game in Seattle, another potentially season-wrecking loss. There won't be any catchy name for this one like the 2012 Fail Mary or the 2014 NFC Championship Game collapse. But had the Green Bay Packers won, it might have become known as "The Robert Tonyan Game." Or "The Kyler Fackrell Show." And they would have been the most unlikely heroes in recent Packers history. Instead, Tonyan's 54-yard touchdown catch on his first NFL reception and Fackrell's three-sack game will be nothing more than a one-off (or in this case, two-off) bright spot in a game -- and season -- that was just another wasted opportunity. If the Packers end up missing the playoffs, they might view Thursday's 27-24 loss to the Seahawks as one of the reasons. Green Bay entered the game with a 43 percent chance to make the playoffs, according to ESPN's FPI. At 4-5-1 with six games to play, that dropped to 31 percent. Considering the Packers play at Minnesota a week from Sunday night, they're streaking toward postseason elimination. And who knows what changes could come after a second consecutive January without the playoffs? "What am I supposed to say? Of course there's hope," he said. "Of course we believe in each other. It's going to take one galvanizing moment. Whether that's a speech or at practice or something happens in the game, something's got to get this thing going. I thought we had moments tonight where that was the way we were going." Sure, the Packers could lose at Minnesota but still win their final five games to finish at 9-6-1. The most difficult game in that final quintet is at Chicago in Week 15. But their margin for error is now next to nothing. And, as coach Mike McCarthy always says, you can't talk about the playoffs until you get to 10 wins. Think the Packers didn't sense what was at stake on Thursday? Roll back the video on Rodgers after he was sacked on third down midway through the fourth quarter. Visibly upset after suffering a fifth sack, Rodgers surely sensed the field goal the Packers settled for with 8 minutes, 23 seconds left in the game that gave them a 24-20 lead -- after Rodgers hit Davante Adams for a 57-yard bomb -- wasn't going to be enough. 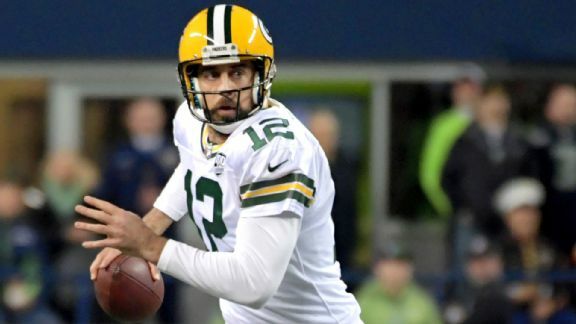 Aaron Rodgers and the Packers struggled on third down Thursday night against the Seahawks. In the same end zone where the Seahawks won the 2014 NFC title game in overtime, they took the lead on Russell Wilson's 15-yard touchdown pass to tight end Ed Dickson with 5:08 to play. "It's been the same stuff; tonight, terrible on third down," Rodgers said. "Situationally, we've got to score touchdowns in the red zone. We had a chance in the first quarter to go up a couple scores -- didn't. Had a chance in the fourth quarter to go up by eight -- didn't get it done. Situational football." At that point, the Packers could have used another Tonyan-like play. Tonyan never caught another pass. Rodgers faced too much pressure. Despite completing 21 of 30 passes for 332 yards and two touchdown and reaching 255 straight passes without a pick, the longest streak of his career, Rodgers didn't have one more winning drive in him. The Packers simply don't have enough weapons outside of Aaron Jones (103 total yards from scrimmage, two touchdowns) and Adams (10 catches for 166 yards). Instead, they went three-and-out -- the third-down play was a throw that Rodgers inexplicably bounced well short of receiver Marquez Valdes-Scantling. "Frustrating, obviously," Rodgers said. "I could do that a hundred times and probably not do that again. It was a gimme. It was a gimme out there. It stuck to my hand." McCarthy punted it away with 4:20 left, hoping the defense would give Rodgers another shot. McCarthy said after the game that he "definitely" considered going for it, but "we played the numbers" with one timeout plus the two-minute warning." But the Seahawks ran out the clock, and possibly the Packers' playoff chances. "Concerned? Maybe a little bit," Packers defensive back Tramon Williams said. "I'm not going to lie to you. Maybe a little bit. But am I optimistic? I'm very optimistic that we can still get the job done. It's not going to be easy, as you all know, but I'm optimistic that we can get the job done."